Home » Recipes » Desserts » Brownies + Cookies » Lemon Bars (Gluten Free Lemon Bar Recipe – BEST EVER) VIDEO! Lemon Bars (Gluten Free Lemon Bar Recipe – BEST EVER) VIDEO! 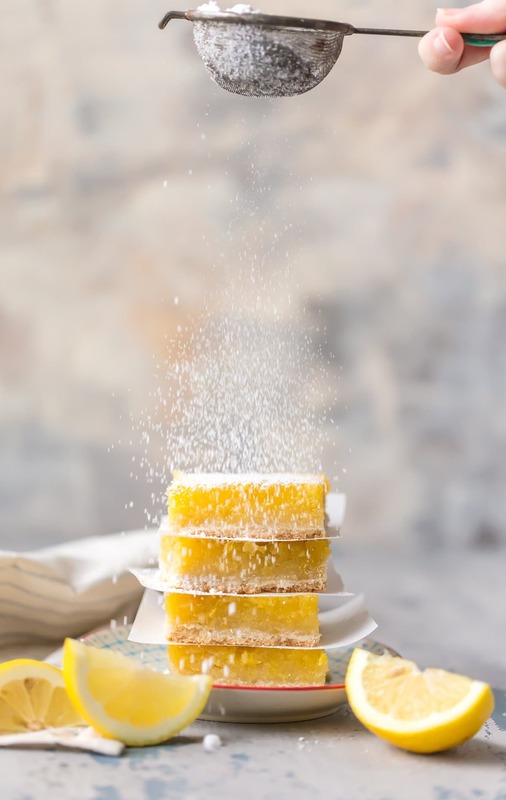 These Lemon Bars were originally posted in April 2017. This post was written in partnership with Bob’s Red Mill. As always, all opinions are 100% my own. 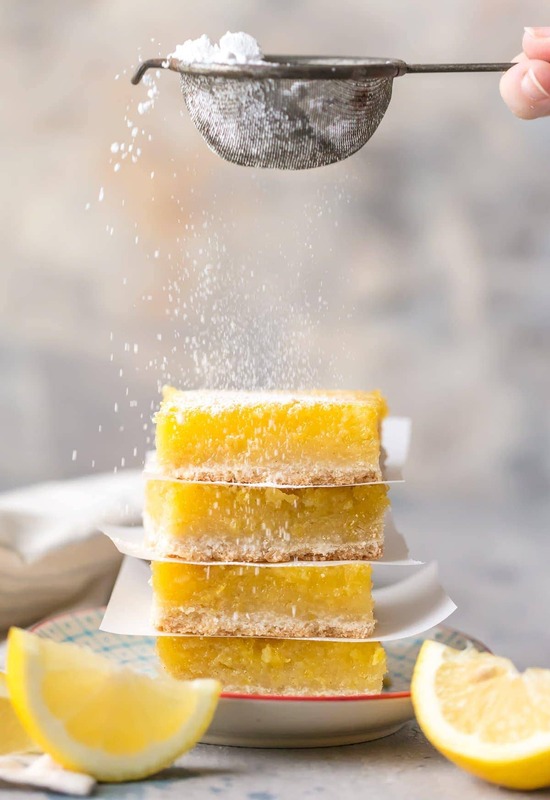 Lemon Bars (Gluten Free Lemon Bar Recipe) are the easiest and best lemon bar recipe, and they just so happen to be gluten free! 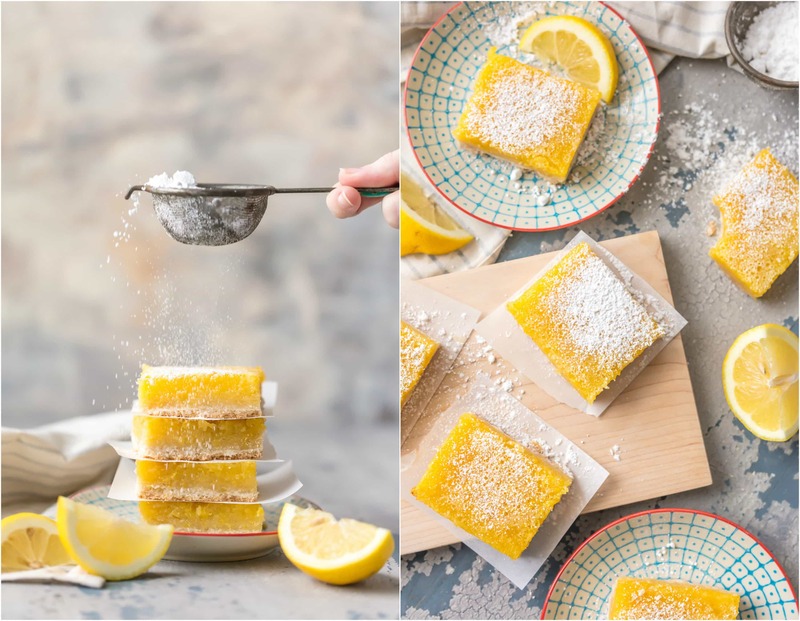 These Lemon Squares are SO DELICIOUS! These are one of our favorite easy gluten free desserts. Thick, creamy, tart, and utterly delicious; The Best Lemon Bars you’ll ever taste. Lemon Bars are a classic recipe everyone should know how to make. 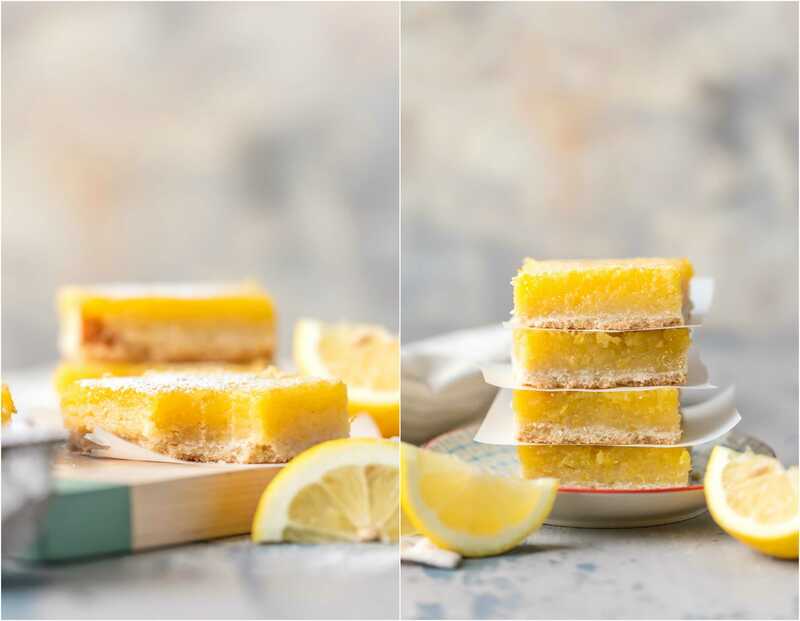 This Gluten Free Lemon Bar Recipe is so EASY, anyone can feel like a pastry chef. Lemon Bars are easier than you might think. Baking is still a bit intimidating for me, as I’ve talked about before. When I started this blog, I couldn’t cook ANYTHING, and I for sure couldn’t bake anything. Cooking seems to be so much easier to me. Throw this in, leave this out…most recipes are easy to customize and hard to ruin. Baking is more precise. It seems like more of a skill. Along the blog’s journey, I’ve had some baking successes that I’m so proud of! 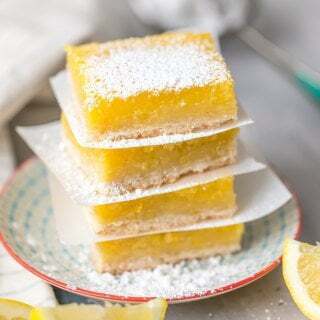 These Gluten Free Lemon Bars are a favorite. Before I attempted these Lemon Bars, My mom helped me make her famous Oatmeal Chocolate Chip Crinkles, I made an amazing Raspberry Moscow Mule Bundt Cake, and I tackled and perfected Mini Nutella Cheesecakes (nevermind that those are no bake. shhh!). Today’s recipe, GLUTEN FREE LEMON BARS, has quickly become one of my favorite dessert recipes on the site. They are SO creamy, dreamy, and EASY! You’ll crave them year round, but they’re especially perfect for Spring and Summer. Lemon Squares just can’t be beat in my opinion. 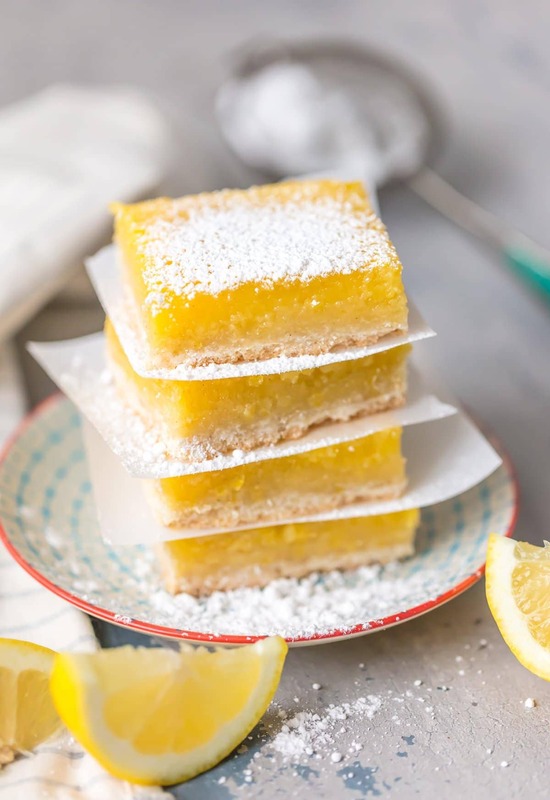 These Gluten Free Lemon Bars are a must-bake dessert! 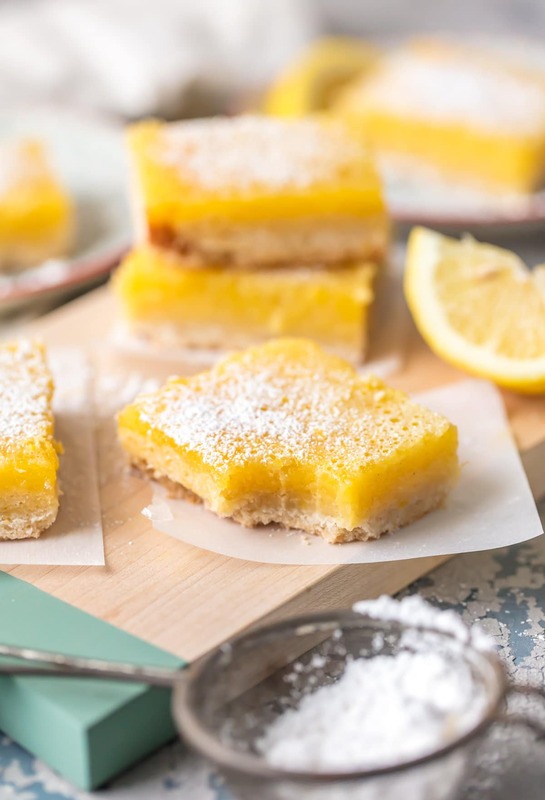 I love the flavor of these Lemon Square AND they’re easy to make. How do you make Gluten Free Lemon Bars? 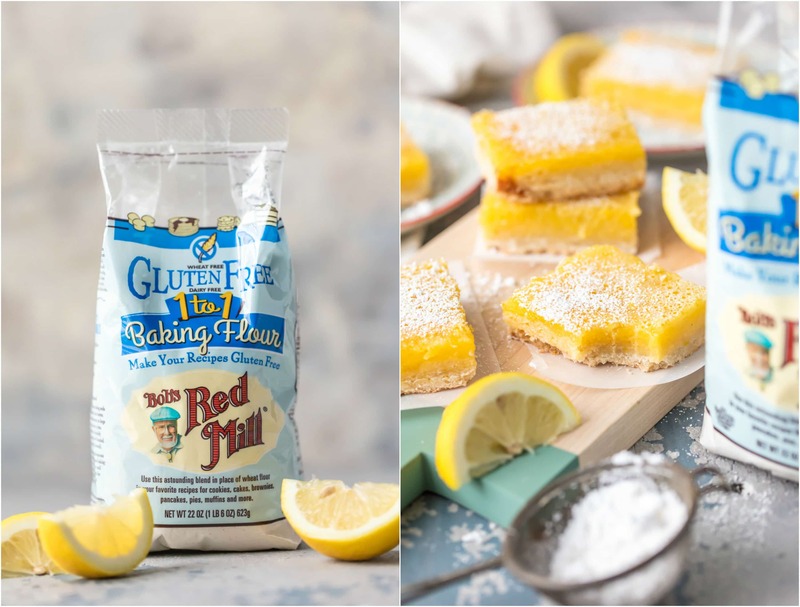 Part of what makes these Gluten Free Lemon Bars oh so easy and perfect is Bob’s Red Mill Gluten Free 1 to 1 Baking Flour. You heard that right, ONE TO ONE. No more adding in special ingredients to make gluten free flours work with your favorite recipes. You can literally add this flour into any of your best bets just as you would all purpose flour and bake away. Bob’s is amazing and making things way too simple for people like me. It’s what makes this recipe one of my favorite Easy Gluten Free Desserts. It’s as simple as swapping out the flour. Thank you Bob’s Red Mill! Pat thanks you too, he’s the inspiration behind these bars. He asked me to work on some gluten free goodies and this was my first attempt. Now that I know how easy they are, they won’t be my last. I sampled a few variations before settling on this Lemon Bar Recipe. I’m SO happy with the result. These Lemon Bars are the right amount of creamy, tart, and crust all together. These lemon bars are so perfect for Easter. Get more Easter Dessert Ideas right here! Do you put Lemon Bars in the fridge? I recommend keeping them cool. 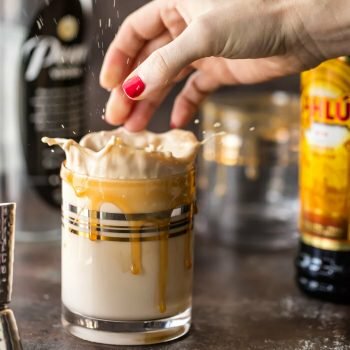 You can keep them in the fridge or on the counter in an air tight container for 2-3 days, but the refrigeration will only enhance the flavor of the bars and keep them extra creamy. How much is the juice of one lemon? On average, each lemon has 2 tablespoons of lemon juice and 1 tablespoon of lemon zest. Great info to know! How long can you keep lemon squares? I recommend no more than 2-3 days in an airtight container. How long is a lemon good for? A lemon can stay good and fresh for up to 1 week at room temperature and 2-3 weeks in the fridge. Cut lemons can stay good for 2-3 days in the fridge. NOTE: If you want to make these with regular flour (instead of gluten free) that’s not problem at all! Just use all purpose flour in the gluten free flours place. Also, I hope you’ll check out all of our Gluten Free Recipes! See the recipe card below or watch our video on how to make Lemon Bars. Enjoy! In a medium bowl, combine flour and sugar. Use a fork or knives to stir in the butter until a crumbly mixture results. Add water a bit at a time. Take mixture and press evenly into the bottom of the pan. Bake for approximately 25 minutes until slightly golden and set. Pour mixture over the still hot crust. Bake 22-26 minutes or until set in the middle. Let cool on the counter for a minimum of two hours. Cut into squares and sprinkle with powdered sugar. If not immediately serving, store in the fridge. *Powdered sugar is gluten free as long as it uses cornstarch or tapioca starch as it's base. so just be sure to double check ingredient list. Sounds great but no use making if I do not have the calories and other nutritional info. Am I missing this?! As you prepare each ingredient mark down the calories, then divide the total number of bars and you have your calorie count per bar. These look delicious, but nothing with that much sugar could be called “healthy.” If you think they’re better for you just because they use gluten-free flour, that’s absolutely not true. There is no health reason to eliminate gluten from your diet UNLESS you have celiac disease or are otherwise sensitive to it. (I have celiac and will be turning to this recipe the next time my sweet tooth calls me. Sweets aren’t healthy for anybody, but of course we all need a treat once in a while. This looks gorgeously yummy, can’t wait to try it out, haven’t tried lemon dessert so far, will be interesting, very excited to try this in my kitchen. Thanks Becky for interesting recipe. Wow! This looks so yummy! I really want to eat it imediately! I’ve been thinking about trying to create a gluten free lemon bar. Looks like I might not have to. These look delicious! I havent been able to find this flour in Australia, could I substitute regular plain flour? 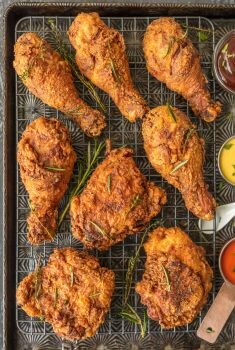 I’ve been looking for gluten free recipes to try, this looks great! Excited to give it a try. Mizaaj-E-Ishq Mein Aib-O-Hunar Dekhe Nahi Jatay…!! !